The JL-JK-OBA Onboard Air system was designed to perform under the most extreme conditions. Each system is 100% Bolt-On and features the heavy-duty Kleinn model 6450RC WATERPROOF air compressor with a 2.8-gallon air tank mounted on a custom designed, Made in the USA, mounting bracket. NO Cutting, Drilling or Modifications are necessary. These Direct Fit systems include all the necessary air line, hardware, fittings and wiring kit with 30-amp relay. The JL-JK-OBA is built rugged with a steel cage and integral skid plate for protection with no loss of ground clearance. The 6450RC compressor is fully submersible so water crossings are no problem. The JL-JK-OBA is capable of inflating 37” tires with ease. System provides an air source for air lockers, small air tools and of course, your Kleinn Air Horn. Each JL-JK-OBA includes a remote mount tire inflator with locking air chuck, digital gauge with pressure relief and storage bag. Want to air up twice as fast? Add the JK6450 Compressor Upgrade Kit to the JL-JK-OBA. 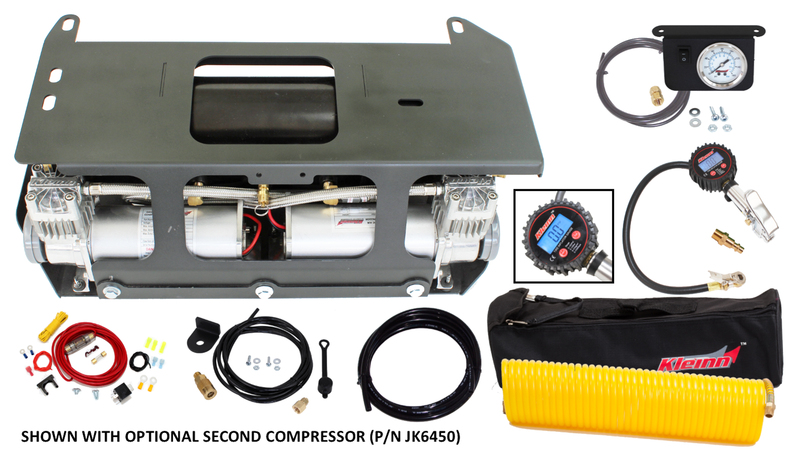 This kit features a second 6450RC waterproof air compressor, tire inflator and all necessary wiring, airline and hardware. With this kit you can air up two 37” tires simultaneously. The JL-JK-OBA has built-in mounting studs and available air ports so no drilling or cutting is required. 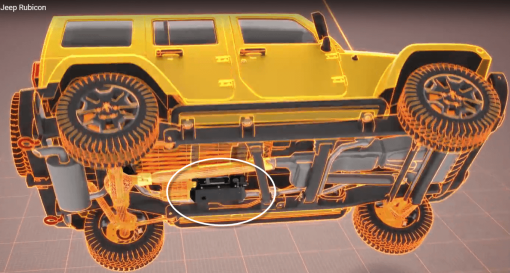 The JL220 Dual Train Horn fits the 2018-19 Wrangler JL and JLU. The kit features a Model 220 dual train horn that produces a thundering 154.2 decibels. Kit comes complete with a direct fit mounting bracket and all necessary hardware. The JK220 Dual Train Horn fits the 2007-18 Wrangler JK and JKU. The kit features a Model 220 dual train horn that produces a thundering 154.2 decibels. Kit comes complete with a direct fit mounting bracket and all necessary hardware.